Partnering with the talented Kevin Kuo, in July 2010 I was able to achieve one of my long-standing mountaineering objectives, Burgundy Spire. Oh, why Kevin, did you have to go back to the midwest, just when it was getting fun! 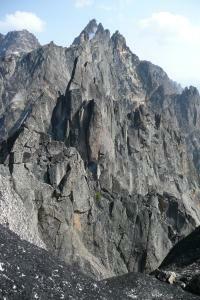 We arrived late Thursday evening for a 3-day weekend at Washington Pass. Forecast was a bit iffy for Saturday and Sunday, but Friday looked clear, so we went for the big objective first thing on Friday. 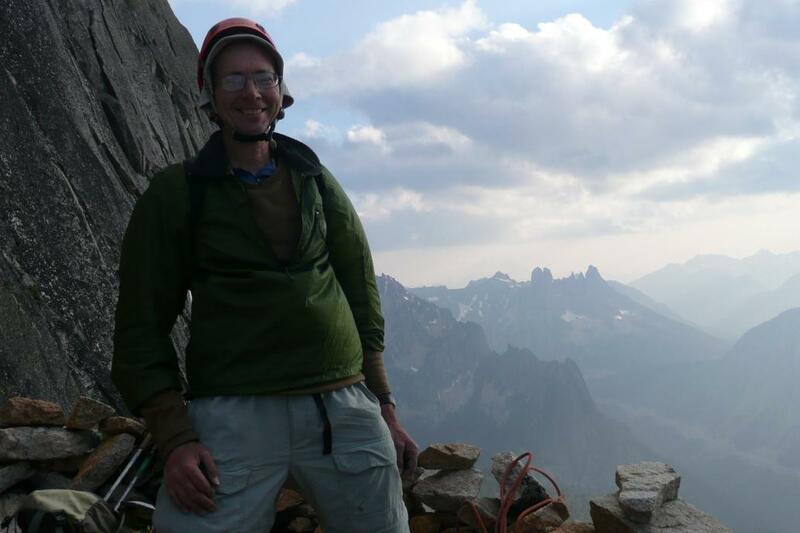 Beckey says "Burgundy is becoming a classic, just for the sake of attaining the elusive summit, one of the most difficult in the Cascade Range. 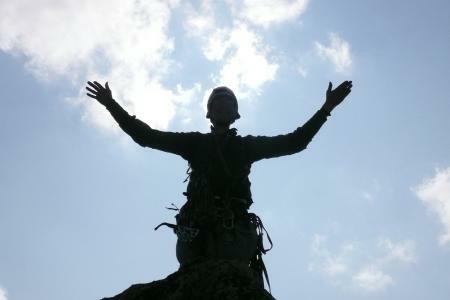 By 1965 the ascent had been done three times." 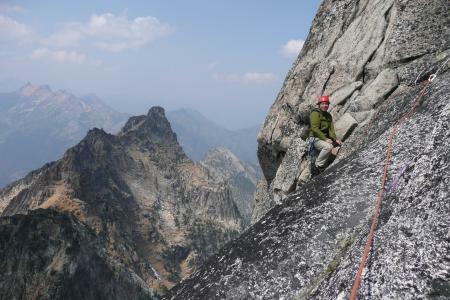 Well, that may be exaggerating, or hearkening back to his week-long trips before the highway went in, but it's really a great classic route on perfect Golden Horn Diorite, to a fine summit, in a perfect alpine setting. After 30 minutes of driving back and forth to locate the approach trail, we decided it wasn't to be found and scrambled down the talus and were off. The "trail" up, once found, is straightforward - straight up! After 2500 feet of gain in the core mile, I was lagging a bit, but felt better when I caught up and Kevin said "I don't feel so good". Thanks, Kevin, you make an old guy feel young again! 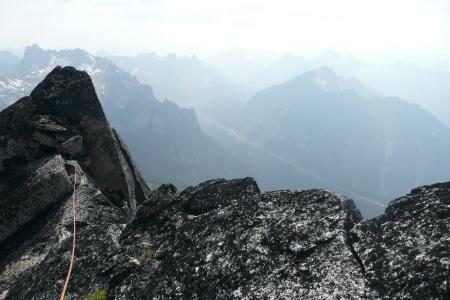 Really, though, I didn't mind lounging at the col for an hour one bit. Originally I was hoping we were fast enough to link up Paisano Pinnacle with Burgundy, but it became clear when we reached the level of the base of Paisano that there wasn't nearly enough time. Paisano is a looong 6 pitches, and anyway we would have had to hike off to the right once we were in the basin to reach the base. Next time...camp in the basin and it should be doable. Quick summary of our travel times. Yep, I'm slow as usual, but at least Kevin got to the car by dark! As for me, I was just glad to get my poor old knees off the steep ridge by dark; once in the woods I didn't mind a few wanderings off the trail at all. 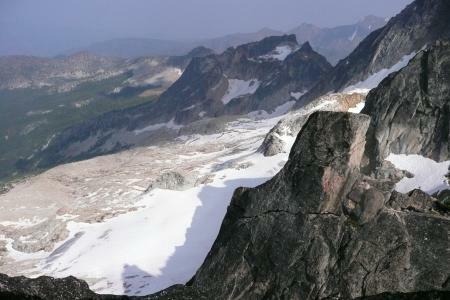 After Burgundy, we connected at the Lone Fir camp with Lisa Ripps and Pat Clark, who had done a crazy scramble up from the hairpin turn onto the apron of Early Winters, complete with raps into gullies with waterfalls, heinous rubble scrambling, etc. Too much adventure for me. 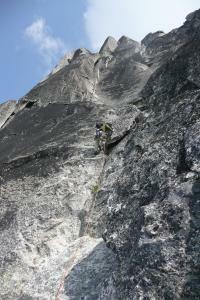 Lisa and I did Beckey on Liberty Bell, descending wet and scary gully slabs. 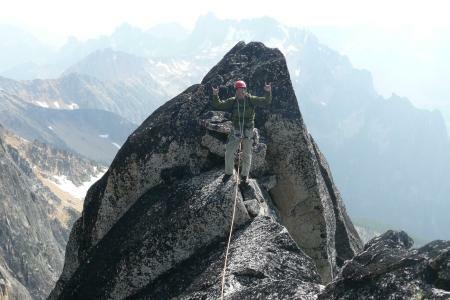 Then we all had a fine day going over Kangaroo Pass and doing North Ridge on Kangaroo Temple, as the light showers ended and the sun came out. Here is way too much beta on Burgundy. After much study of TR's, I think we managed to find the perfect (i.e. 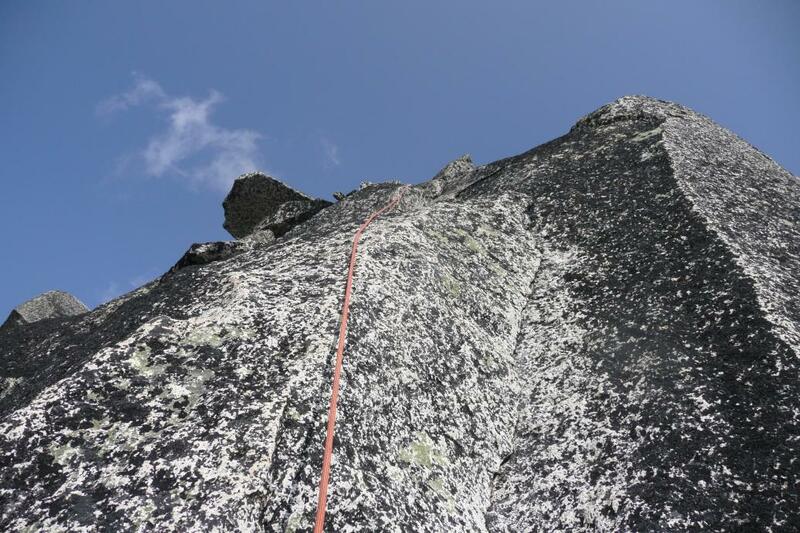 easiest, most fun) route to the top, which is the North Face to NW Face route. There is a cairned track near the lower end of the road talus that leads to the established climbers trail. But it's perhaps better to descend just before the uphill end of the talus - much shorter and easier in the talus. Two cairns where you enter the woods point you through the woods at a second log bridge across Early Winters creek upstream of the log bridge on the established trail. Continue on this line and you hit the trail abut 60 yards from the creek. 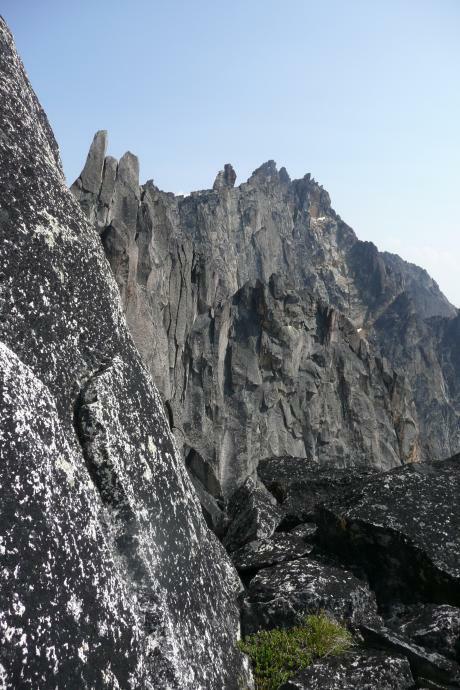 Note three cairns on the trail in this area, and look back and observe how you got there. Continue along the trail through deep woods until you come near Burgundy Creek, then up the wooded ridge left of the creek. Walk past the camp area in the basin, and start up the rock/scree gully where you exit the forest. About 300 feet below the top of the gully, after it turns into mostly scree, look for an exit right that traverses a bowl, through a small saddle, over the head of another talus field, through small trees/scrub, and into the Burgundy Col gully about 400 feet below the col. Several options/tracks are possible for the start of the traverse, cairns on the right side of the bowl mark this option. Note: dragging camp gear to Burgundy Col would be rough, but allow for multiple climbs once you are there, since there is permanent snow to melt on the east side of the col. There is no water after snowmelt in the basin. 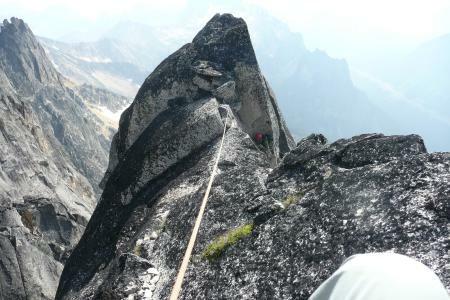 Route: After the initial 3 rope lengths of 4th class, bypassing the last 20 feet of the ridge tower on it's right, you traverse above the big NW gully and arrive at the large bench and smaller upper benches under the North Face. Best option is the left-hand, right-facing corner. 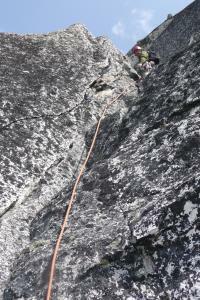 Scramble up as high as reasonable to belay. 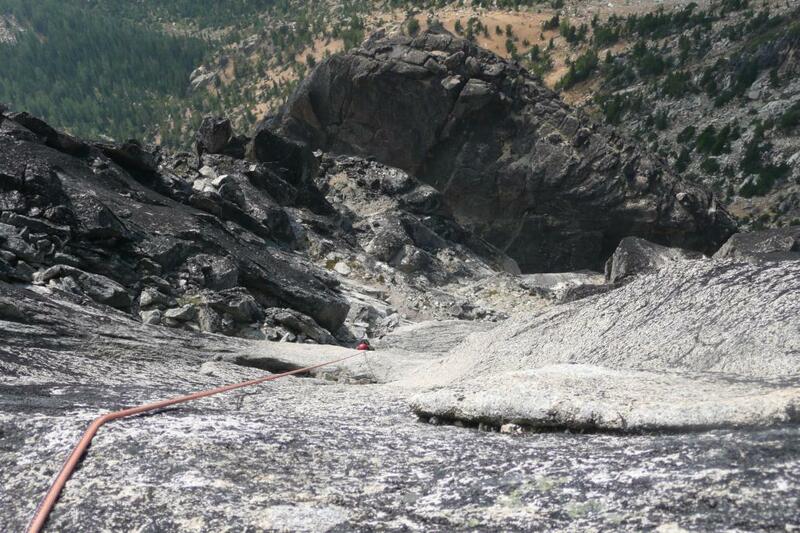 About 2/3 up the corner take a rising traverse right to the rap sling, then straight up through the crux flakes. A belay about 30 feet below the "sandy ledge" is about as high as you can reach with a 60-meter rope, and past the difficulties. Follow the sandy ledge right under the leaning block to the ledge end. Belay here, step left 6 feet and head up the shallow groove, trending left, then curving up right to a nice belay platform on the arete. Here a beautiful dihedral leads up nearly a full 60m rope length to a platform 20 feet below the West end of the summit ridge, where crack options exist on both sides of the summit ridge. 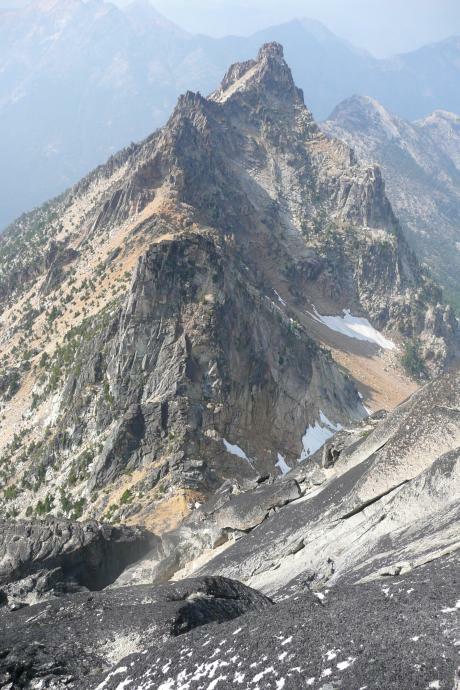 Choose the left side, with a short easier-than-it-looks 5.8 4-inch crack, which falls to a 3-inch cam at the bottom, a few stout moves, a 1.5 inch cam about 8 feet up, and easier moves to the summit ridge. 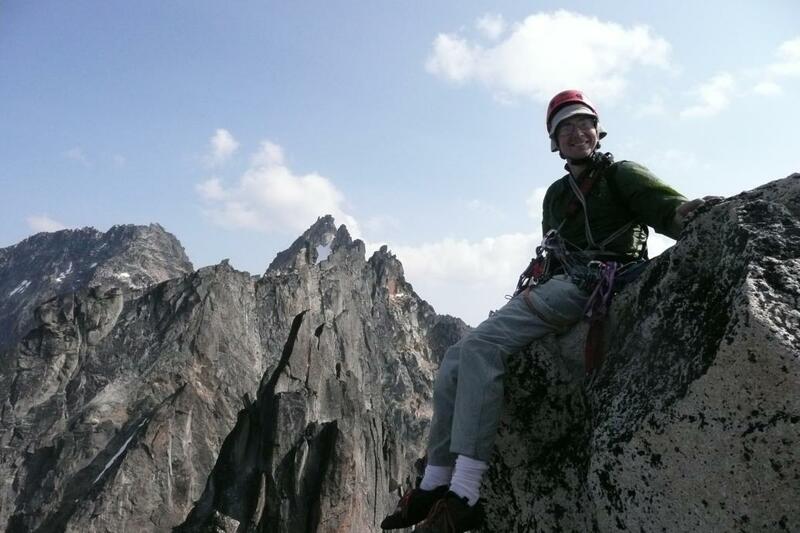 Traverse 25 feet along the ridge and belay at the base of the final 7-foot summit block. 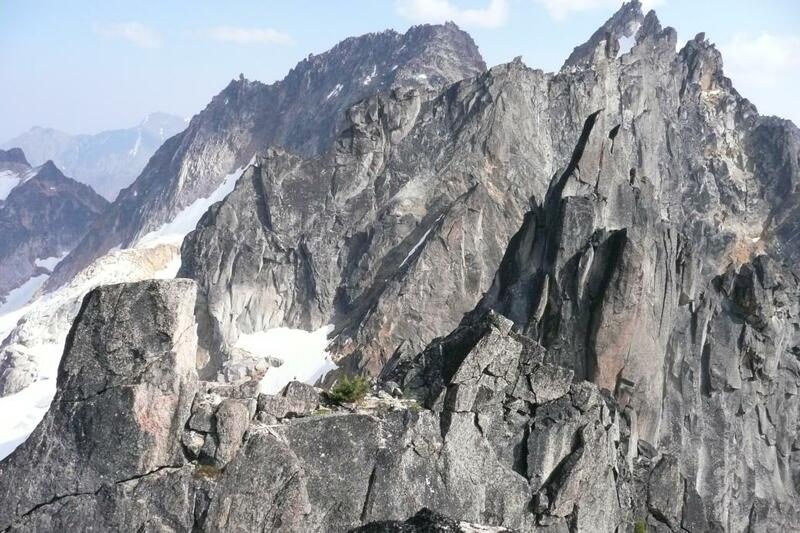 The unprotected few moves from here to the true summit stand are a must! 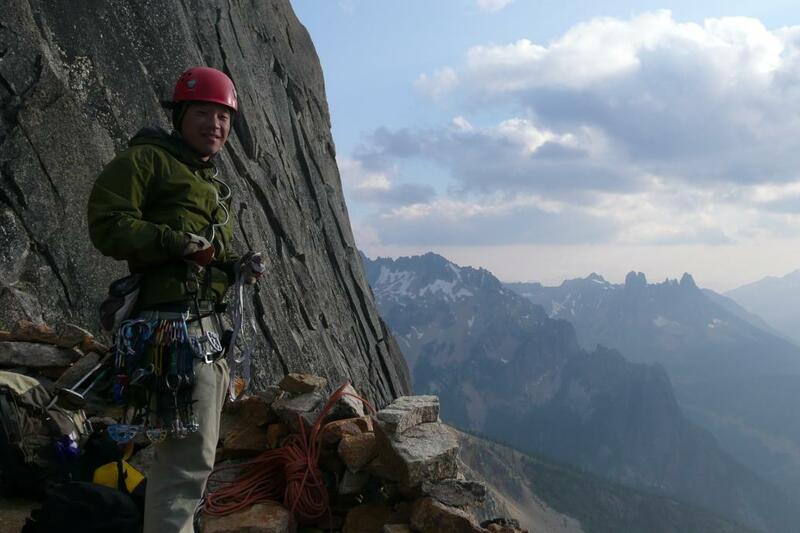 Walk around the summit block and find the rap station above the west face 5.9 offwidth. Note the frequent reports of stuck ropes here and do two single raps and one double rap to the base of the North Face. Scramble back down the ledges on the left side, then rope over the head of the NW gully and around to the next rap anchor at the top of the 4th class section. 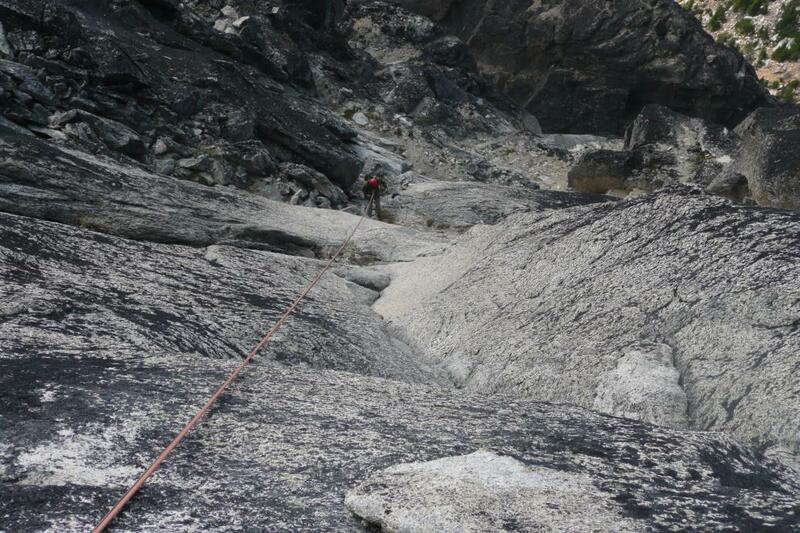 Two double raps to the col; we finally managed to get the rope stuck just 30 feet above the col!